Ose Leopard 4082 1600Kv X2 motor and esc upgrade. This works well in many boats in the 33-36" range. Including the Traxxas Spartan and M41 boats. 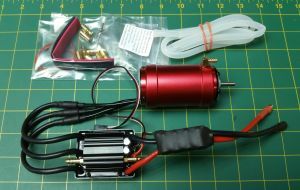 RTI (ready to install) Motor and Esc combo by OffshoreElectrics. This system will run faster than the stock Traxxas system, while remaining cooler and have much reliability. We have done all the hard work, soldering and installing the parts for top performance. 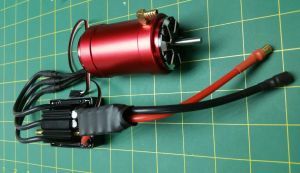 Leopard 4082 Motor X2 1600kv. Seaking 180 Version 3 Esc. Extra OSE 6.0 mm bullet connectors for your batteries. Enough for 1 set of battery packs and a set for your charger. OSE 6.0mm bullet connectors installed on the esc and motor. (2) 3s 45c 5000mah Lipo packs. This is the only way to go! Must modify setup for ESC, but results are outstanding. More speed & much cooler running temperatures than the stock setup. Ran today with the Spartan upgrade ESC and Motor package with upgraded flex shaft kit. Talk about turning heads! Once your on the gas screaming down the lake you will get the attention of everyone. Fastest boat I own now. Well done OSE! Bought this for my spartan because I'm a speed/power fanatic and let me tell you. This system is BUILT for the spartan. Way more power, a bump in speed and WAY WAY WAY cooler temps.